Bring Me the Horizon will play their only UK festival show in 2019 at next summer’s All Points East (APE) event in Victoria Park, London. In their first headlining festival show, the British metal act will curate and headline APE on Friday 31 May, topping a bill that also includes Run the Jewels, Idles, Yonaka and more. The APE announcement follows on the back of tragedy for Bring Me the Horizon, who described their horror after a fan died at their Alexandra Palace show last Friday (30 November). They join previously announced APE headliners/curators Chemical Brothers (24 May) and Christine and the Queens (26 May) and Bon Iver (2 June). 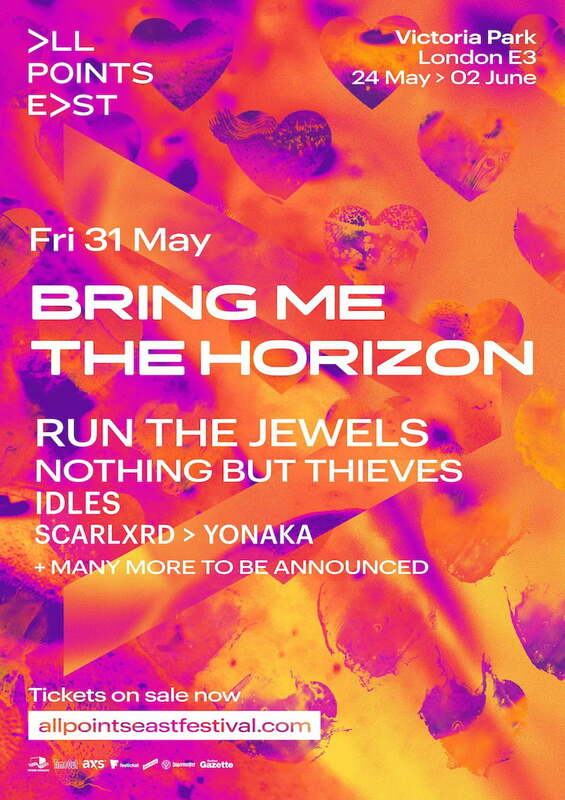 Jim King, senior vice-president of festival promoter AEG Presents, comments: “We are beyond thrilled to be able to welcome Bring Me the Horizon to the East Stage next year for their long overdue first festival headliner set. All Points East, which has a daily capacity of 40,000, debuted to a “phenomenal” response in 2018, after AEG was awarded a five-year exclusive on the use of the east London park. It follows a similar format to the company’s successful British Summer Time (BST) event in Hyde Park, combining two weekends of music with a BST-style free-to-access midweek offering, All Points East In the Neighbourhood. All Points East 2019 runs from 24 May to 2 June. Tickets for the Bon Iver and Chemical Brothers shows are on sale now, with GA day passes priced at £71.55.